It's probably everybody's favorite comfort food: spaghetti and meatballs. And on The Early Show Monday, the "Queen of Italian Cuisine," famed chef, TV host and cookbook author Lidia Bastianich, prepared her version of the classic dish, making it even more comforting! She also offered some different ideas on how to serve the meatballs. Bastianich hosts "Lidia's Italy" and penned, among other cookbooks, Lidia's Family Table and Lidia's Italian American Kitchen. The recipes she demonstrated Monday came from those two books. It was all Part One of a new Early Show series, "Comfort From the Kitchen," focusing on some of winter's best comfort foods. After all, in tough times, the tough -- eat even more comfort food! 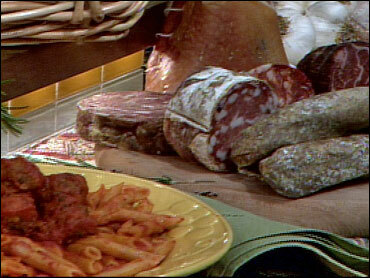 Bastianich showed her classic version of meatballs, using a combination of pork and beef. But she's quick to point out that meatballs can be delicious made with anything -- ground turkey, if you want something lighter. Even fish. Or, if you're looking for an easy shortcut, go with Italian sausage: Simply remove the casing and form the meat, which has already been flavored with herbs and spices, into meatballs. She also showed that meatballs can be served in a variety of ways: small meatballs for kids, giant meatballs as the star of the meal, or as an appetizer, served on a bed of vegetables. A bit of culinary history: Smaller meatballs are more traditionally Italian; the huge, hulking meatballs you find in Little Italy and other red sauce capitals are an Italian-American invention. There's really nothing out of the ordinary in Lidia's meatballs: beef, pork, onions, breadcrumbs, garlic, etc. But she focuses on the process. After forming the meatballs, you roll them in flour to help them brown nicely, then fry them in a bit of oil. Once they've browned all over, you drop them into some tomato sauce and allow them to simmer gently for 30 minutes or so. Bastianich makes a very simple tomato sauce; she says that, as the meatballs cook, they continue to add complexity to the sauce. Now, the really important part: You don't cook the pasta and then mix it directly into the red sauce. You want to cook and drain the pasta, then spoon two big ladlefuls of sauce over the noodles and toss until the strands are just coated. You can then spoon some meatballs on top of the spaghetti, or simply pass the meatballs on a platter, along with some extra sauce. Pass the tomatoes and their liquid through a food mill fitted with the fine disc. Heat 1/4 cup olive oil in a 4- to 5-quart pot over medium high heat. Stir in the onion and cook, stirring, until wilted, about 4 minutes. Pour in the tomatoes, crushed red pepper and bay leaves, and season lightly with salt and pepper. Bring to a boil, then lower the heat so the sauce is at a lively simmer. Cook, stirring occasionally, 30 minutes. Meanwhile, crumble the pork and beef into a mixing bowl. Sprinkle the bread crumbs, 1/3 cup grated cheese, the parsley, and garlic over the meat. Beat the egg with 1 teaspoon salt and 1/4 teaspoon salt and 1/2 teaspoon black pepper in a small bowl until blended. Pour over the meat mixture. Mix the ingredients with clean hands just until evenly blended. Don't overmix. Shape the meat mixture into 1-1/2 inch balls. Dredge the meatballs in the flour until lightly but evenly coated. Heat 1/4 cup olive oil and the vegetable oil in a large, heavy skillet over medium-high heat. Slip as many meatballs into the skillet as will fit without crowding. Fry, turning as necessary, until golden brown on all sides, about 6 minutes. Adjust the heat as the meatballs cook to prevent them from overbrowning. Remove the meatballs, and repeat if necessary with the remaining meatballs. Drain the pasta and return it to the pot. Spoon in about 2 cups of the tomato sauce, tossing well until the pasta is coated with sauce. Remove from the heat and toss in 2/3 cup grated cheese. Check the seasoning, and add salt and pepper if necessary. Serve the pasta in warm bowls or piled high on a large warm platter. Spoon a little more of the sauce over the pasta, and pass the remaining sauce separately. Pass the meatballs family-style in a bowl, or top the bowls or platter of spaghetti with them. Break up the dry bread slices into pieces roughly an inch or two across-you should have almost 4 cups-and put them in a shallow bowl or baking dish. Pour enough milk over to cover them, and soak for 4 to 5 minutes. When the pieces are completely soft, gather them in your hands and firmly squeeze out all the milk; you should have almost 1 cup of densely packed moist bread. Loosen up the turkey meat if it's been compressed in packaging; spread it out in a large mixing bowl. Pour the beaten eggs on top, sprinkle on the parsley, porcini powder, salt and freshly ground black pepper. Scatter the drained raisins and the pine nuts on the meat, then spread the cooled wilted onions on top. Break up the clump of wet bread, spreading little bits over the meat. Now fold, toss, and squeeze the meat and seasonings together with your hands and fingers to distribute all the ingredients evenly. Form, flour, and fry the meatballs following the instructions below. Pour the olive oil into a medium skillet, drop in the minced onion and fennel, and set over medium-high heat. Stir them in the pan for a minute or two, until they begin to sizzle; clear a space for the garlic, and get it sizzling on the side for a minute or so. Sprinkle on half the salt, and stir all together. Turn down the heat and cook for 5 minutes, stirring occasionally, until the vegetables are wilted and slightly dried, but don't let them color at all. Scrape them out of the pan to cool. Meanwhile, take all the sausage meat out of the casing (if packed in links), crumble it up well, and spread it out in a large mixing bowl. Pour the beaten eggs on top of the meat. Add the parsley, remaining salt, pepper, orange zest, thyme leaves, and spread over all the cooled onions, fennel, garlic, and the bread crumbs. Now fold, toss, and squeeze the meat and seasonings together with your hands and fingers to distribute all the ingredients evenly. Spread the flour about 1/4-inch deep in the center of a baking sheet. Pour vegetable oil into a large, heavy skillet or sauté pan- 12 inches in diameter if possible- to a depth of at least 1/3 inch. Scoop up a portion of meat with a small ice cream scoop, a large spoon or your fingers. Lightly shape the meat between your palms into 2-inch balls, a bit larger than golf bowls (or whatever size you like). Drop each ball onto the floured sheet, roll it around until coated, then pace it on another baking sheet. Form and flour all the meat into balls in this manner. Set the skillet over high heat until the oil is very hot. With tongs or a spatula, carefully transfer meatballs to the pan, as many as you can, leaving at least an inch or so between them. Cook for a minute or two, until they've started to brown on the bottom, then turn them continuously- watch out for oil spatters- until golden crusted on all sides, about 6 minutes. As they are done, transfer the fried balls to a baking sheet. When all the meatballs are on the tray, sprinkle salt lightly over them (just a couple pinches in all).